AVA Electric Dog Bark Collar Upgrade 2018 - by [Revolution Energy Controller] x2 Work Time - Vibration No Shock - No Bark Collar for Small Medium Large Dogs Best Barking Collar - Pet Safe Waterproof by AVA Electric at People For Pets. Hurry! Limited time offer. Offer valid only while supplies last. ATTENTION! THIS IS NOT A MAGIC DEVICE! The time of correction for each case individually, but not less than 14 days! (usually from 14 to 30 days)! ATTENTION! THIS IS NOT A MAGIC DEVICE! The time of correction for each case individually, but not less than 14 days! (usually from 14 to 30 days)! At the beginning of use, your dog may experience increased irritability, and in this case, observe the following rules. Turn off the collar and put it on the dog (let it take 3-5 hours). After that, turn on the collar for 30-60 minutes. (increase the operating time of the device, but not more than 8 hours). If this instruction does not help WRITE us, and we will advise you individually! RECHARGEABLE! NO NEED ADDITIONAL BATTERY FOR USE. Press + - button to adjust the sensitivity. Higher quality polyester Belt with 2 reflective strips. 6. The indicator light lighted means it is working. This is best humane remote bark collar for you'r little buddy good boy or girl! WATERPROOF DEVICES Our automatic deterrent sonic ecollar have smart stop control function. Product have extra battery (not rechargeble) and accessories for training your dog either big, medium or little (puppy). It is used for dogs of different weight categories from 6.6 to 120 lbs. It's not shoking, not static, no spray. This elite device is guardian for you tiny toy dog. It is very safe ultrasonic collar. This is rechargable electronic non shocking anti-bark controller . 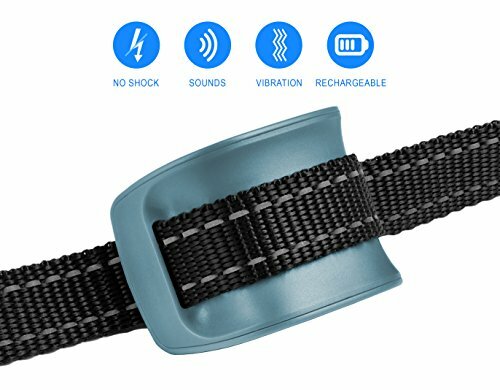 HARMLESS SOUND AND VIBRATION - dog bark collar effective and easy to use. It uses progressively increasing sound and vibration to help stop your dog's barking instead of painful methods.For safety and comfort we recommend the collar for dogs ranging from 6.6-120 lbs.Anti bark collar for outdoor training mini, small, puppies, large dogs for all breed. NEW DESIGN - New type of dog bark control collar Along with a new ergonomic design the electronics inside the collar now use more intelligent software. AUTO OFF FUNCTION - To protect the dog if the continuous stimulus reaches the 7 levels then the bark collars will stop working for 1 minutes. IMPORTANT INFORMATION - To avoid negative feelings do not leave this Anti Barking collar on your dog for longer than 8-10 hours.ATTENTION ! Correction time for each case individually but not less than 14 days! If you have any questions about this product by AVA Electric, contact us by completing and submitting the form below. If you are looking for a specif part number, please include it with your message.